Page 2 | Blog | Atkins & Co.
We have recently received many emails asking if HMRC have been sending out “Refund Forms” by email… The answer is NO!! It’s actually a Phishing Scam! Don’t give out private information (such as bank details or passwords), reply to text messages, download attachments or click on any links in emails if you’re not sure if they’re genuine. 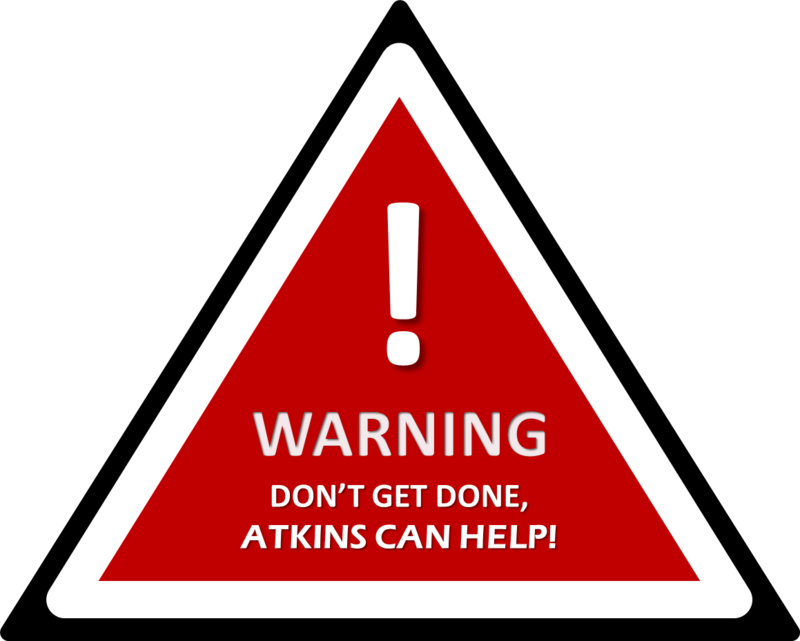 If in doubt Ask Atkins, contact us admin@atkinsandco.com or call in office hours 01934 527888. Have you seen the recent adverts on Facebook, Twitter about uniform Tax Refund? Be very careful what you are signing up to! Many of you may already have received the Laundry Tax Refund through a PAYE adjustment made to your March 2014 pay. You may be signing up to future Income Tax issues you may end up owing the TAX MAN. If you are unsure if you have already been re-reimbursed your Uniform Allowance, check your March 2014 Payslip for an adjustment to your Tax Code. It would have been inflated to include the rebated allowance. Alternatively, you can call HMRC on 0300 200 3310, quote your National Insurance Number and they should be able to advise you if you have been in receipt of a Laundry Allowance Rebate (Earlier years Adjustment). Bear’s enjoying his summer…. YOU COULD BE TOO! 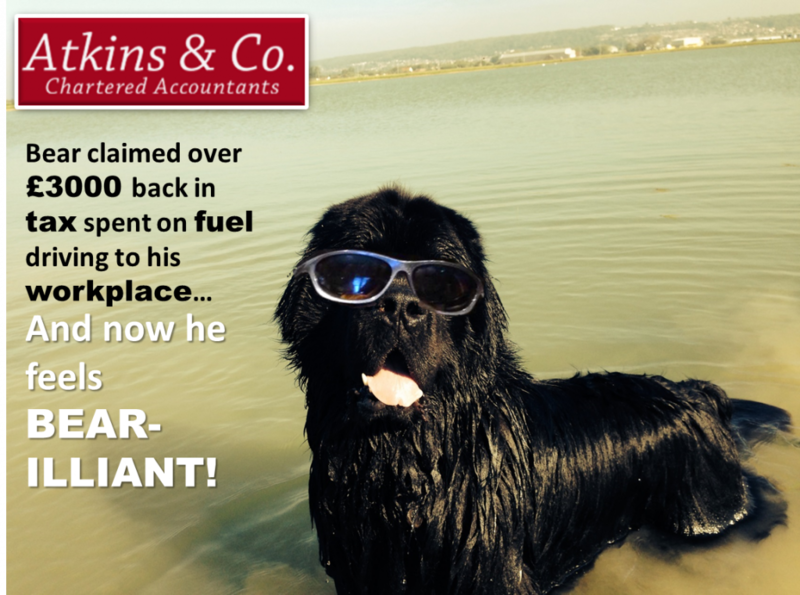 Contact us TODAY to see if you are eligible for a Motor Mileage REFUND! Keep COOL this summer! Click HERE! WARNING! This may be seriously good for your bank balance! This warning may be seriously good for your bank balance! Taking one minute to read this could save you a moments grief should you find yourself in this situation. We have recently seen an increase in clients seeking our help to sort out the wrath of HMRC and their fines having been left in “unchartered waters” by Tax Refund Companies! We would just like to advise you that although you may be signing up with these companies that are offering lucrative refunds, your best interest may not be the priority. We have recently had a case where someone signed up to one of these such companies and had an unsuccessful claim, they were unaware that the company had opened Tax Returns for the last four years the company took no further action and the client was not advised further. Very quickly £5000 of fines were racked up as a consequence. The Tax Administration had not been correctly dealt with. The company would take no accountability for this and had built in terms and conditions which exonerated them from responsibility and left the client unsupported. Sadly we are seeing more and more clients in this situation seeking our help. We are urging you all to read the small print and T’s & C’s however it may be written. You may have to go looking for it! Be aware of what you are signing up for. If you are in this situation or have been fined by HMRC and you are not sure why please don’t leave these fines to escalate into huge fine’s let us know so we can help you resolve it today! Atkins are a fully regulated, fully qualified team of Chartered Accountants and can deal as such with all aspects of accountancy and tax. We have your best interest at heart and we won’t leave you high and dry in “unchartered waters”. 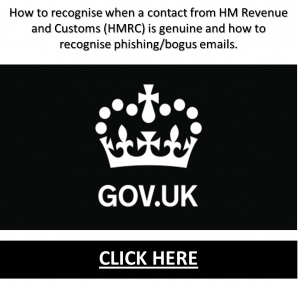 If you have received an email from HMRC recently notifying you of a refund this is a Phishing Scam! Please think twice before giving your Bank Details online! 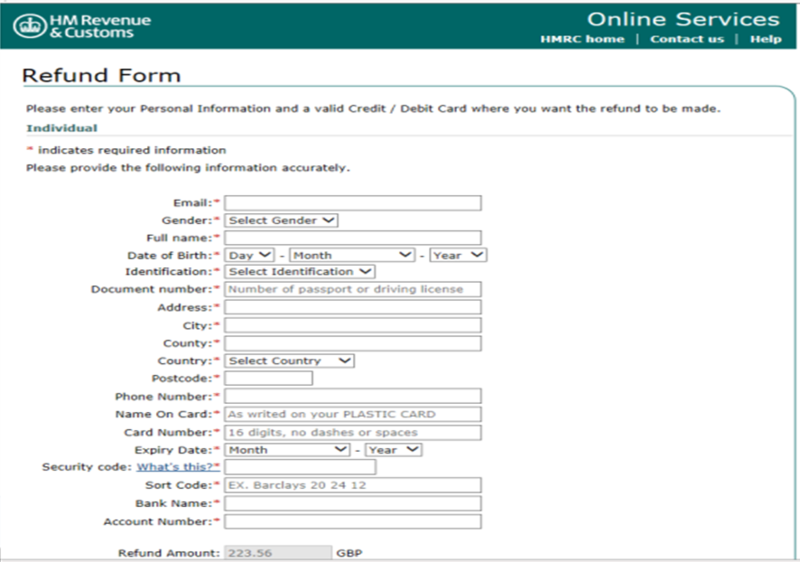 This may look like a genuine HMRC form… It’s actually a Phishing Scam! Don’t give out private information (such as bank details or passwords), reply to text messages, download attachments or click on any links in emails if you’re not sure they’re genuine. Ask Atkins: How do I get tax back on my mileage? MOTOR MILEAGE CLAIMS – also known as Get you home (GYH) and Home to duty (HDT) mileage refunds is our specialty. 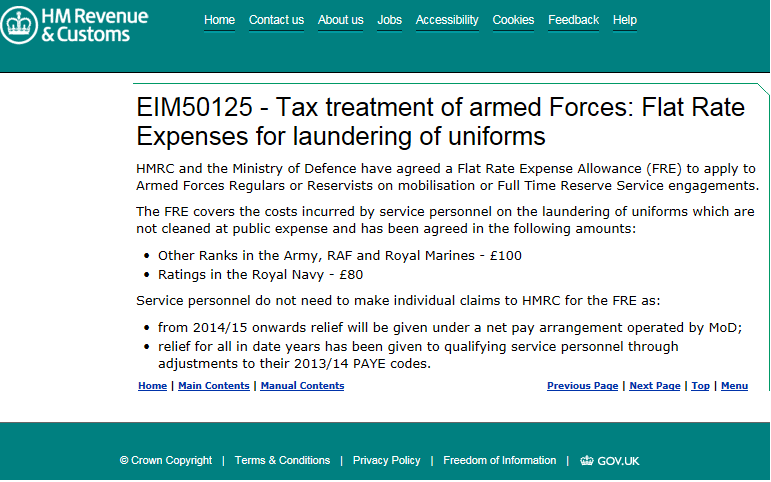 These Military tax rebates are called a number of things such as MOD tax refund and Armed forces tax refund. We have even heard it called Tax back on fuel claim and the rift refund. It doesn’t matter what you call it! The search leads you to the same destination …. HOW DO I GET TAX BACK ON MY MILEAGE? – Firstly download and print the Atkins military mileage claim pack link. You can find this on our website. – In this pack you will find 8 documents. Please read through the information sheet page 1, these are the rules & regulations of the claim and are in accordance with the HMRC criteria. If you are in doubt please let us know we are more than happy to guide you through the setting up process. – You will also need to fill in two HMRC forms, the 64 – 8 and the SA 1. These will need to be sent to us as hard copies. Please ensure you sign these documents before sending. If you need help filling out these forms out please call the office using the above details. – If you do not have access to a printer – no worries! Just let us know your address so we can arrange to Post them out to you! Once received, sit back and we will ‘square the admin away’! 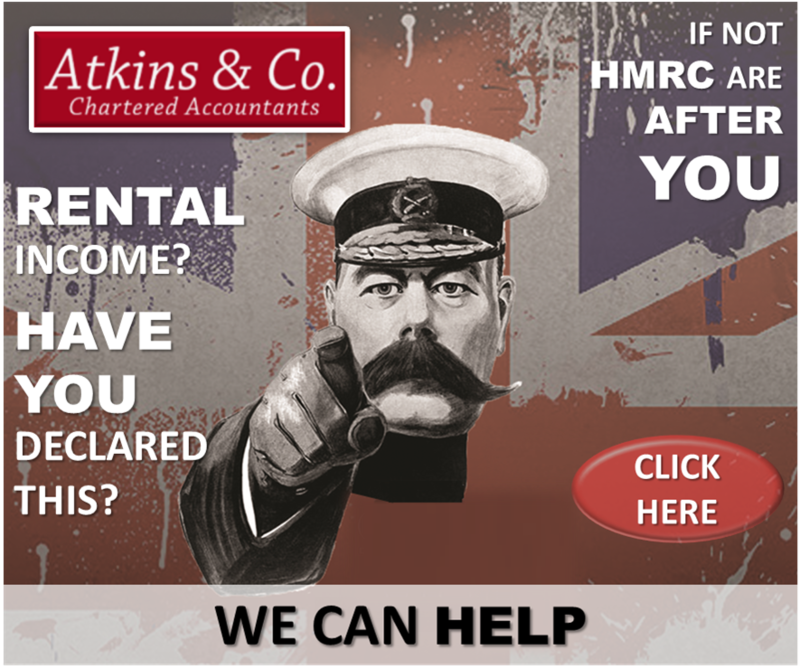 We pride ourselves here at Atkins on great service and are proud to be conveyed as “Military friendly Accountants”. We have very close links with the Military, especially the Royal Marines! So you are in safe hands. We prefer to over deliver and under promise. We want YOU to keep and enjoy your refund which is why we charge a FIXED FEE unlike others that take a %! With an average 4 year claim we could be saving you up to £490… So what will you spend your savings on? Reports of post going AWOL! 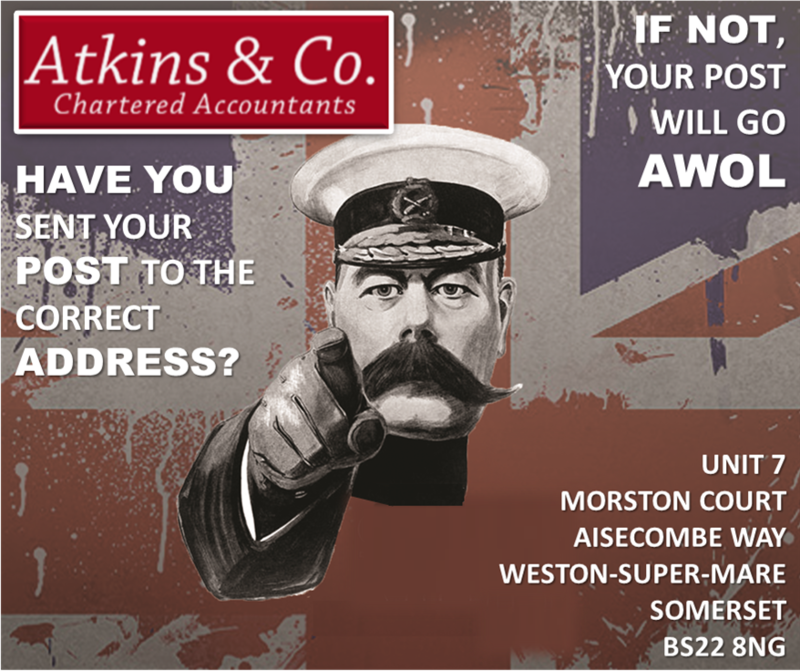 Make sure that when recommending friends you send your post to Atkins & Co. ACCOUNTANTS and NOT the SOLICITORS! 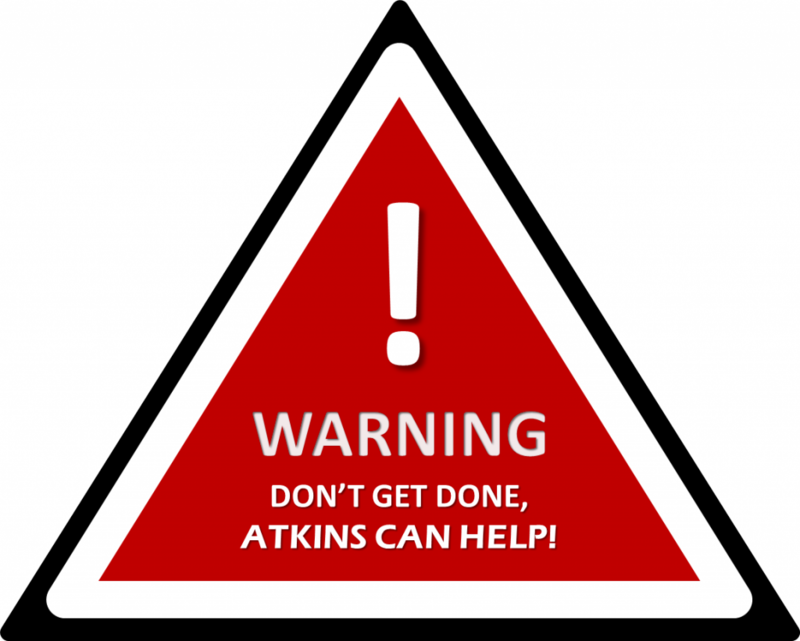 Ask Atkins: Landlords! HMRC are closing in on your undeclared Rental Income! The Revenue is on the trail of £550m missing tax and is urging landlords to come clean or risk higher penalties. Wrong – you do still need to declare them. Wrong – you still need to declare them. But are you making a profit in the eyes of the tax man! If you have a repayment mortgage then it is quite likely you are actually making a profit. And if you are genuinely making a loss then it is in your advantage to report this to HMRC. Wrong – if a property is jointly owned you each need to declare your share of the income. HMRC are running a Let Property Campaign to encourage landlords to come clean and tell them about their rental property before they track you down. HMRC can contact letting agents for a list of landlords, scrutinise ‘property to rent’ websites/ newspapers and they already hold information on those who receive tenants housing benefit directly and those who have used the Deposit Protection Schemes, so if you are a landlord then act now. It will be in your best interest to volunteer the information than if you try to ignore it and HMRC catch up with you! Contact us now or download the RENTAL income & expenses form and send it back to us! – We can HELP! 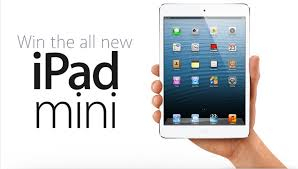 Recommend a friend for your chance to win an iPad Mini. Click on the picture above and Forward your friend our Claims pack. They will need to let us know who recommended them so your name can be entered into our Free draw! Have HMRC emailed you recently? Copyright 2014 Atkins and Co - All Rights Reserved. Atkins & Co. is a trading name of Atkins Accountancy Services Ltd, Registered Office: 7 Morston Court, Aisecombe Way, Weston-super-Mare, BS22 8NG.Registered in England No. 6665976 We are registered with the Institute of Chartered Accountants in England and Wales as Chartered Accountants and can be found on the register at http://find.icaew.com/ using our name and location.